You know you just can’t get enough of Colorado when you move here for the winter skiing and find yourself looking for a way to stay all summer long. That’s exactly how many of us river guides find our way to American Adventure Expeditions. We typically start out as ski patrollers or ski instructors while the snow is flying up at Monarch Mountain; then, as it starts to melt, we begin to look for an adventurous seasonal summer job that will keep us outside. Others of us left corporate jobs seeking a lifestyle change. We wanted to slow it down, pursue a higher quality of life, and do something we really love-outside. Some of us have previous whitewater experience either in a kayak, or growing up on rivers in the Midwest. Some of us show up at AAE confident in the water, others of us are getting on the river for the first time. We come from all over the world- and as far away as Nepal, South America, and Ireland. But all of us are hard workers, good communicators and undergo an extensive hiring process. 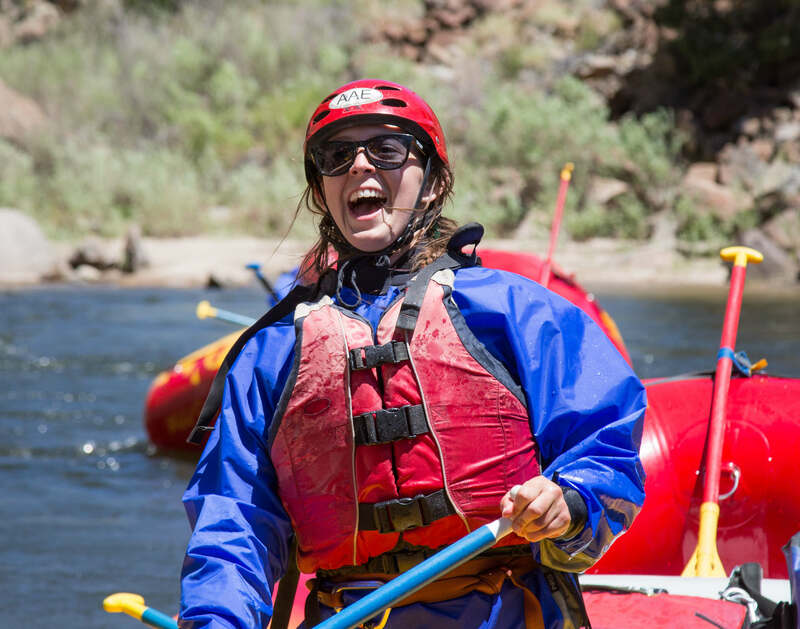 And one thing’s for sure, no matter what path brought us to the river- we’re wild about the work we get to do every day, guiding people safely on awesome adventures down the Arkansas River. Before we’re able to do that though, we go through a pretty rigorous training program with AAE to become a Class III raft guide, one that extends well beyond state standards. First time guides start start training on the river during the third week in May, under in house, seasoned and certified guide instructors- who’ve already tallied over 1,500 river miles themselves. Throughout the intensive three week training, which means long days and tons of time on the water (100 hours total), we run through every emergency scenario imaginable- swimming rapids, flipping rafts, and practicing swift water rescues. A thorough CPR and First Aid course is also part of this training. Off the river we work on group dynamics, guest communication, knot tying, hydrology studies, gear fitting, and equipment maintenance. To wrap it all up, each new guide takes a final test- or checkout trip- running a group of commercial guests down the river, with a guide instructor on the boat to supervise and take over if needed. After this successful checkout trip is completed, the new guide is ready to run the river. Guides wanting to be trip leaders for up to 10 boats have to first accumulate at least 500 documented commercial river miles. 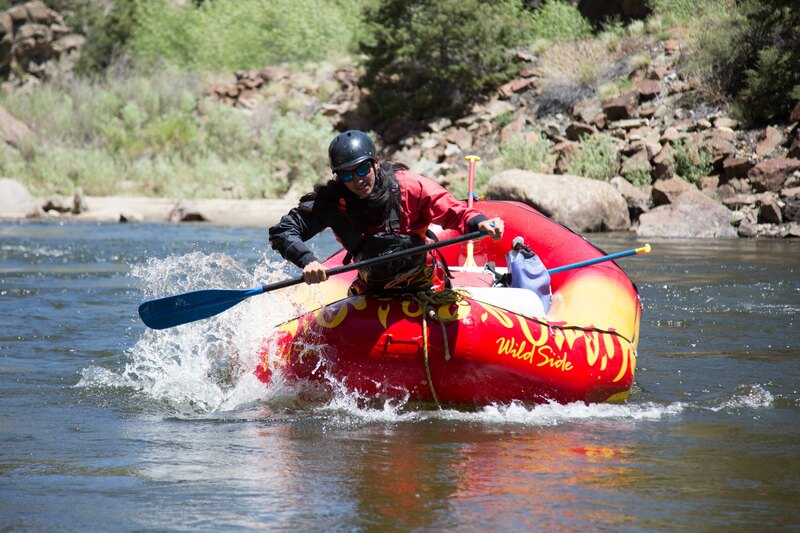 Those of us guides wanting to run commercial trips on the Royal Gorge have to complete 750 river miles; and for the Numbers, it’s 1000. We also have to complete another checkout trip before guiding these sections. River guides are the greatest asset of AAE and a huge part of who we are as a company. We know that a potential guest can chose to run Browns Canyon with any number of other river outfitters, but we believe -and our well over 2000 five star Trip Advisor reviews prove it- that our guides are a step above the rest. As a matter of fact, more than 90% of those reviews mention their river guide specifically by name. But don’t just take our word for it, check out the reviews for yourself and see why AAE’s river guides the only guides you’ll want on your Arkansas River raft trip this summer.